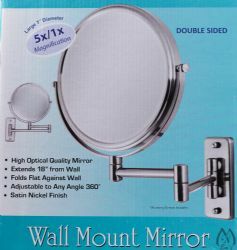 This dual-sided 5X/1X Wall Mirror is a "must have" when you want to get a closer view for shaving and grooming. On one side the 5x magnification mirror allows you to see the details, while the other 1X side lets you check your appearance. Extend the mirror's arm to the most convenient reach for your viewing preference.